The Alaska Board of Fisheries will vote on 47 proposals at the Bristol Bay Finfish meeting this week. Advisory committee reports will be a major factor. At their meetings, the Lake Iliamna and Lower Bristol Bay ACs weighed in on the contentious and recurring issue of permit stacking. The Lake Iliamna Advisory Committee opposed proposals that would allow one person to operate two commercial fishing permits at the same time. Chair Randolph Alvarez worries permit stacking would hurt local fishermen who have a permit but no boat. Current regulation allows a boat with two permit holders on board to fish with an extra 50 fathoms of net. Alvarez says that regulation’s original intent was to allow a person who had a permit but no boat to get on board another vessel. According to Alvarez, the permit stacking proposals would undermine that intent. “They would go on the boat as a second permit holder. But if that permit holder bought another permit for himself, he wouldn’t need that guy. And those people that have those permits without a boat would not be able to fish, and then they would probably sell out,” he said. The committee also opposed a sport fishing proposal that would restrict commercial opening times in the Nushagak District. Brian Kraft submitted the proposal. Kraft is a lodge owner, and he wrote that the sport fishing industry shoulders the burden of conservation, which he believes it should split more evenly with commercial fishermen. The Lake Iliamna AC only commented on one subsistence proposal, which they opposed. 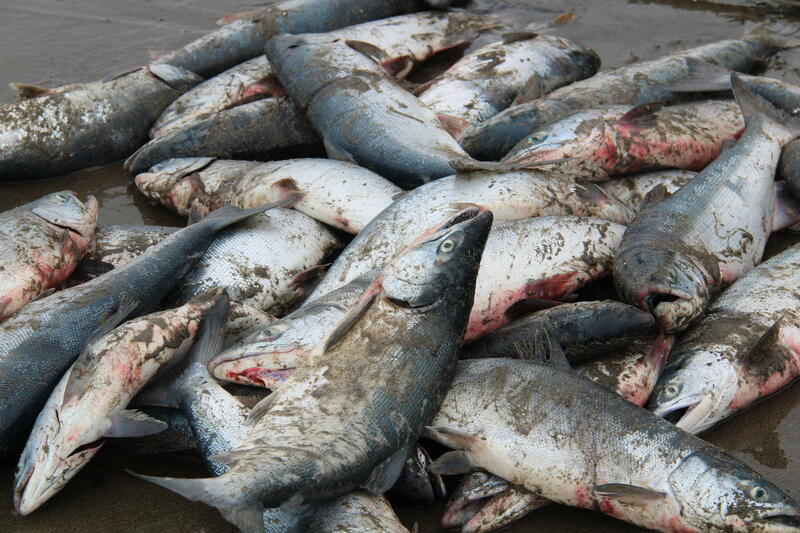 The proposal would allow subsistence dipnetting in the Nushagak River. All Alaskan residents can participate in subsistence and personal use fisheries. Subsistence fisheries are chiefly in rural areas of the state. Personal use fisheries are established in non-subsistence areas designated by subsistence law. Both the Lake Iliamna and Lower Bristol Bay Advisory Committees opposed extending the maximum drift gillnet vessel length from 32 to 42 feet, citing support of local fishermen. The Lower Bristol Bay Advisory Committee was more conflicted on permit stacking – at least when it came to set netting. Members were evenly split on a proposal that would allow a fisherman with two set gillnet permits to stack those permits and operate a total of 100 fathoms of gear in the Naknek-Kvichak, Egegik and Ugashik districts. Currently, a person can own two permits but operate only 50 fathoms of set net gear. Committee Vice Chair Eddie Clark proposed the change. In the proposal, he wrote that set netting in those districts is primarily a multigenerational family effort. He argued that many families have more than one permit. This proposal would allow one person in a family to take on the permit of another who can’t fish. Mitch Seybert is the committee chair. The Lower Bristol Bay AC voted against proposals for drift gillnet permit stacking. The Bristol Bay Finfish meeting begins on Wednesday at 8:30 a.m. Advisory Committee reports and public testimony kick off Wednesday afternoon. Correction: this article has been updated to clarify that a person can own two set net permits, not operate them at the same time.